There’s a reason why chicken soup is called “Jewish Penicillin”. It’s because of how nutritious broth is! Broth contains many minerals and in a form that is easier for the body to absorb. There’s also gelatin. Gelatin acts like a poor man’s protein because while it isn’t a complete protein is serves as just enough to help those who could not afford meat survive. I hope everyone can now afford meat in this day and age but if you can’t or if you want to save some money then broth is a great way to get some of that “protein”. Gelatin is also great for digestion. Gelatin coats the intestine, strengthens gut walls and strengthens digestion. All of this is great because it not only helps you absorb more nutrients but it also helps you digest foods. It’s because of this that broth is such a vital part of the GAPS diet, which many have used to heal digestive issues or even allergies! If you are wondering why you should make broth instead of just buy it in the store, there are many reasons. It’s cheaper, it’s more nutritious, and homemade doesn’t have any yucky ingredients! This recipes is so very easy to make. I love to make my chicken in the crock pot; yes one whole chicken in the crock pot and after I pick the meat off, I just start cooking all this lovely broth! Optional – garlic, onions, celery, carrots, herbs. Place your chicken carcass/bones in your crock pot and cover with the water. After the hour, turn on the crock pot to low and cook for 18-24 hours. If you are adding any vegetables, herbs, etc you ideally should add them later on, usually toward the half way mark or in the last few hours. After broth has finished cooking, allow it to cool off a bit. Once cooled, strain the broth through a colander, cheesecloth, or muslin in order to separate your broth from the bones, veggies, etc. 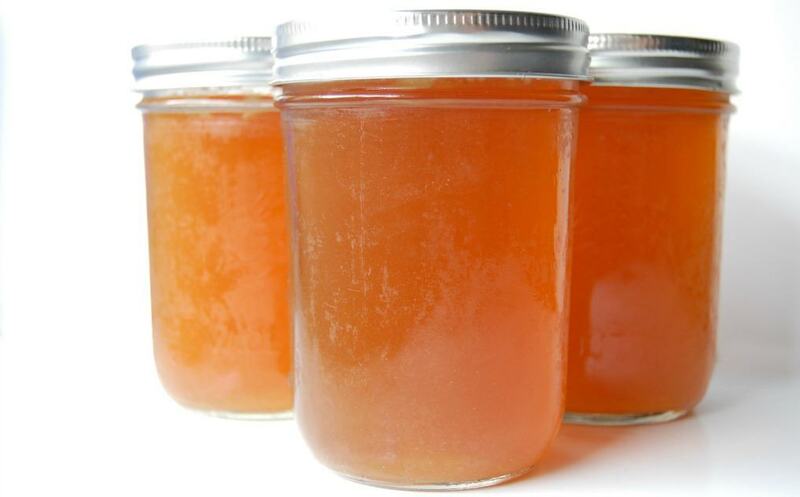 Store in jars and use within a few days or store in the freezer for months. Makes about 6 cups of broth. 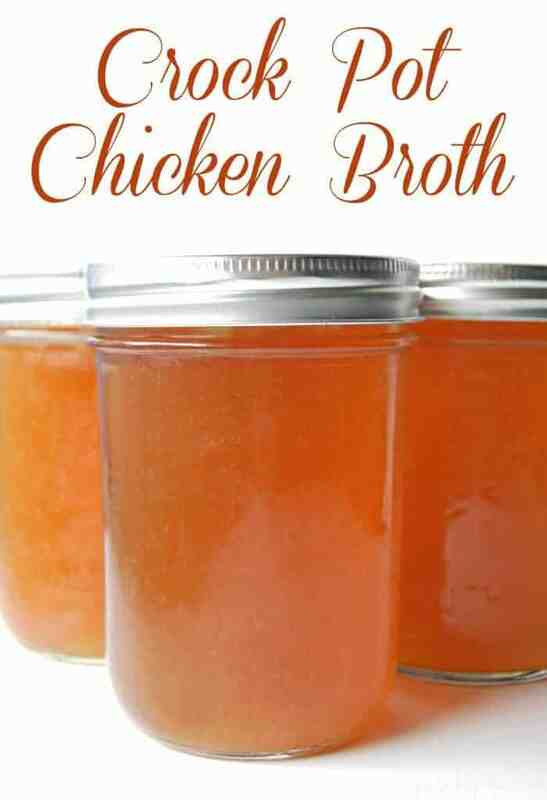 This is my favorite way to make my own chicken broth! I don't cook it for quite as long as this recipe calls for… I cook it on low for only 12 hours. I only started making my own broth a couple of months ago and I can't believe I didn't try it sooner. It's easy and has saved us money on canned broth. It also helps me justify the expense of buying a whole organic chicken. Jenny – Yes! I originally baulked at the price of an organic chicken ($20/2 birds) but when I get so much out of them, it's totally justifiable! Have been looking for a great recipe for broth! By the way, I would love for you to link this up to Healthy 2day Wednesdays this week (and every week until Saturday afternoon) You can add articles such as recipes, natural remedies, going "green" tips, suggestions, etc. Hope you'll check it out! I made broth in my crockpot for the first time last week, it worked really well! I'm hosting a weekly blog carnival specifically for soups, stocks and chowders, every Sunday. I would love it if you would come over and post this recipe. Here's a link to last Sunday’s carnival, so you can see what it’s all about! Do I/can I leave the drippings from the chicken in the crockpot when making the broth? That's what I do! Why bother with all that mess (unless you want to make gravy). I just take out the chicken, take off the meat, put the bones back in and water. It makes for a really flavorful broth! Do you seal the jars before putting them into the fridge/freezer? Nope! There's no need to bother with sealing if you freeze them. As for fridge you just need to use the broth within a few days.